The dominant transport systems in use today rely on inventions born during the industrial revolution. As WRI research shows, new digital technologies are beginning to change this, creating entirely new business models and disrupting the market. In many cities, it’s possible to request a taxi or shared car with the push of a button. Commuters can switch seamlessly from buses to trains to trams and back again. Bicycles can be found on every corner, unlocked remotely and keyed to your phone. And sometime soon, autonomous cars will join the fray, perhaps even delivering goods to your front door. Collectively these “new mobility” services are radically reshaping the transport landscape. But not everywhere. Even as new transport options come to residents and businesses in some cities, rapid growth has overwhelmed others, especially in the global south. The most rapid urbanization rates are in Africa and Asia, where 90 percent of the 2.5 billion new urbanites expected by 2050 will live. Unplanned, disconnected growth is not only leaving many out of the new digital economy, but exacerbating other problems. Road accidents claim 1.25 million lives every year – drivers and pedestrians – with numbers rising in developing countries, which already account for 9 out of 10 deaths. The transport sector pumps out 23 percent of all energy-related greenhouse gas emissions, and this may reach 33 percent by 2050. The number of deaths caused by air pollution worldwide has increased 20 percent since 1990, to 4.2 million a year. New mobility services can help address these challenges, leading to greener, safer, more inclusive and efficient transport for all. Shared mobility powered by digital technologies can increase vehicle occupancy, reducing per capita carbon emissions. Affordable, user-friendly bikeshare and ride-hailing systems can help commuters travel the “last mile” to and from transit stations more easily, enhancing the attractiveness of public transport. In both passenger and freight transport, digital platforms are improving efficiency by providing new ways to match supply and demand. New platforms to share and dispatch freight trucks more efficiently are significantly reducing empty backhauling, for example. Autonomous vehicles are smarter and lighter, promising the potential for better efficiency, fewer vehicles on the road and a sharp reduction in crashes. Traffic accidents are not the only type of risk: violence and harassment are serious concerns for many commuters and pedestrians, especially women and other vulnerable groups. Smartphone alert systems and apps to report incidents and educate transport users and providers are presenting new solutions to old problems. Similarly, open data is allowing many to see comprehensively what transport options are available to them, evaluate those choices and make informed decisions – or advocate for change. 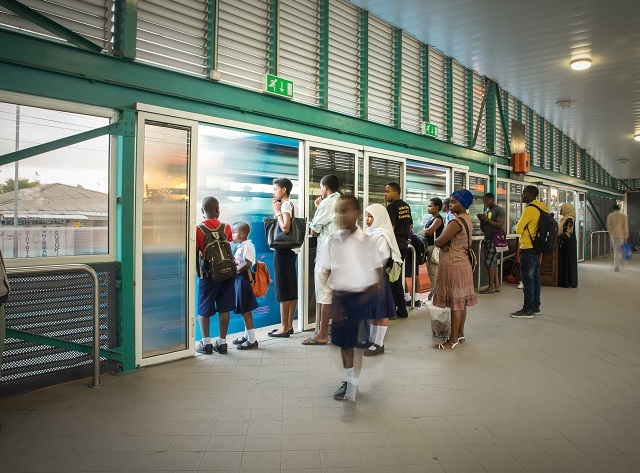 In Haiti, the World Bank is using big data to understand the mobility patterns of the population, and plan more inclusive and integrated public transport systems that address the needs of the poor and reduce travel time and costs to users. In countries where transport data has traditionally been scarce, this is a radical shift, potentially allowing greater access to jobs and essential services. This progress creates countless opportunities, but technology alone will not be enough. The world needs ambitious policies that keep transport demand under control and create the right incentives for people and business to embrace sustainable mobility. Without careful planning, self-driving cars could increase congestion, pollution and sprawl, dockless bike sharing could lead to mountains of waste, and app-based taxi services could price public transit out of the market. We must help policymakers carefully manage the adoption of new mobility services in order to maximize benefits and avoid pitfalls – and find more ways to bring these benefits to the most vulnerable. There is a tremendous economic prize for getting this right. The recently released Global Mobility Report, using data from the International Energy Agency, finds that, when considering full costs – including vehicles, fuel, broader expenses and losses – more efficient and sustainable mobility could deliver global savings of up to a staggering $70 trillion by 2050. In the years ahead, we have a unique chance to create transport systems and cities that bring housing, jobs, services and all the promises of the digital economy to everyone. To do that, smart digital solutions need to be a core element of any sustainable mobility strategy. With urban areas expected to house 70 percent of the global population by 2050, it’s not only the promise of better cities and transport on the line, but a better world. Transforming Transportation is the annual conference co-organized by the World Bank and WRI Ross Center for Sustainable Cities in Washington, DC. This year’s theme is “Realizing Sustainable Mobility for All in the Digital Era.” Tune in to the livestream and follow the conversation on Twitter following #TTDC18. José Luis Irigoyen is Senior Director for the Transport and Information and Communications Technologies Global Practice of the World Bank.